← Tuna Steaks, Ginger and Broccollini…oh yeah! Was having some food-loving friends over so had to do some recipe digging since everybody was making a big contribution. I’d heard some great things about Yotam Ottalenghi and had flipped through a couple of his cookbooks. 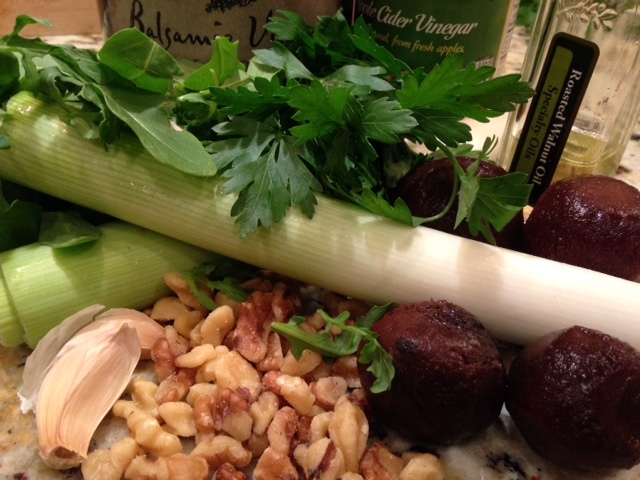 I remembered this one, Beet, Leek and Walnut Salad from his Jerusalem cookbook. I did have to google the recipe because I’d seen it when looking through the book at a friend’s place and wasn’t able to borrow it before making dinner. So, this might not completely match his. Begin by roasting the beets. Preheat an oven to 425°. Scrub the beets, wrap in foil, and roast for 45 to 60 minutes or until they are fork tender. Set aside to cool. (Was nice to skip this step) Once the beets are cool, peel and cut into bite-sized wedges. Transfer to a bowl. To cook the leeks, place in a medium saucepan with enough salted water to cover. Bring to a boil, reduce the heat to medium-low, and simmer for 10 minutes or until the leeks are just tender. Drain and rinse with cold water, then cut into smaller pieces and transfer to another bowl. Meanwhile, soak a tablespoon of tamarind pulp or paste in 1/4 cup of hot water for 20 minutes. Strain, reserving the liquid. (hmmm, wonder what this might bring). To make the dressing, combine the walnuts, garlic, chili flakes, vinegars, oils, 2 to 3 tablespoons of the reserved tamarind water, and salt and pepper to taste. Let stand at room temperature to combine the flavors. Gently toss the beets with half of the dressing and the leeks with the remaining dressing. To serve, place some of the arugula onto serving plates, top with a few beets, followed by more arugula and some leeks, and then a few more beets and some more leeks. Scatter the fresh parsley or cilantro over top and garnish with pomegranate seeds for an extra special burst of fresh flavor (I totally did not get that fancy, it’s called tossed salad). 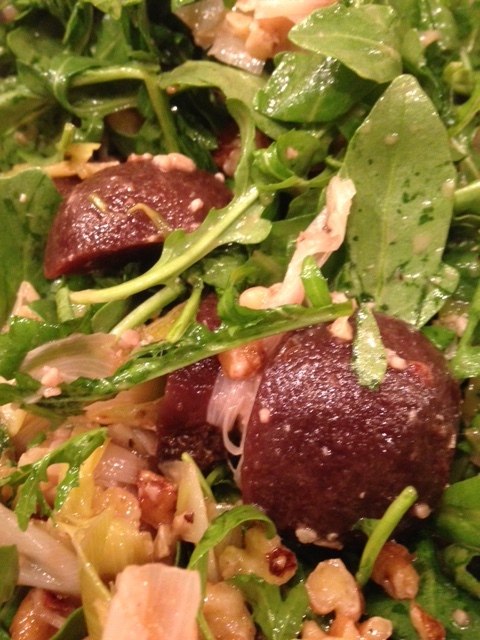 It was a very tasty, tangy salad, though I did overdress it (but dressing was good, so it’s not like that was problem). Next time I might do roasted leeks because the boiled ones were a bit tasteless. Might actually seek out tamarind at some point. Was glad to make it and try a new flavor blend!